When I flipped the calendar to 2018, I had no idea I'd be working on a bed quilt by the end of the month, and actually be sleeping under it by the start of spring. glory be! Yes, a new quilt for our bed had been on the list for at least a couple of years, but it took Rachel/Stitched in Color hosting The Big Bed Quilt-Along to actually get me going on it. I'd been collecting low-volume fabrics for months on end, having no idea what I'd actually do with them. 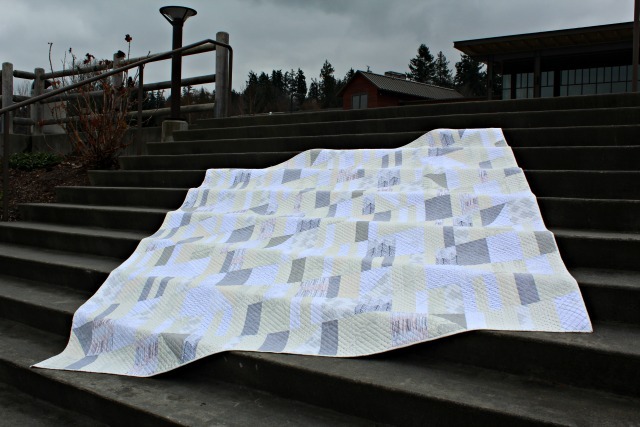 I had in mind maybe an improv pineapple quilt, but when I saw Meghan/Then Came June's Sidewalk Chalk pattern start popping up in Instagram, I changed my mind. It was a pattern, yes, but with an improvisational feel, and it seemed oh so doable - you know, like it might actually get done in a reasonable amount of time. And truth was, I loved loved! every version I saw. So that was settled, and I started in. 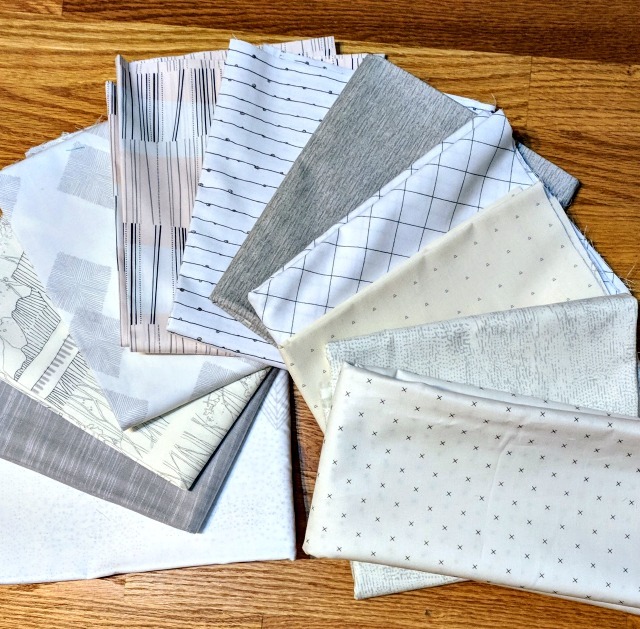 Rachel had been posting a variety of helpful posts along the way, and near the end of sewing my rows together, her Planning Quilt Size post turned on a light bulb. so I got my measuring tape out pronto and realized I would need to add an extra row and column both to make my own quilt sized appropriately for my bed. It's a good reminder to take a look at those dimensions listed on any pattern you use - they're all relative. Luckily, with Sidewalk Chalk, it was really easy, and after a good review of the pattern, even keeping that improv feel was a cinch and adding on didn't hold me up too much. By mid-February, I had a finished quilt top! Measuring 96" x 112", it was BIG! Ie. too big for me to want to quilt myself. My decision was quick, easy, and logical (to me) - purchase a few yards of the crisscross in black wideback by Carolyn Friedlander, which was one of the low-volume fabrics in my original pull, pack it all up, and send straightaway to Rachel/Stitched in Color herself for long-arm quilting. 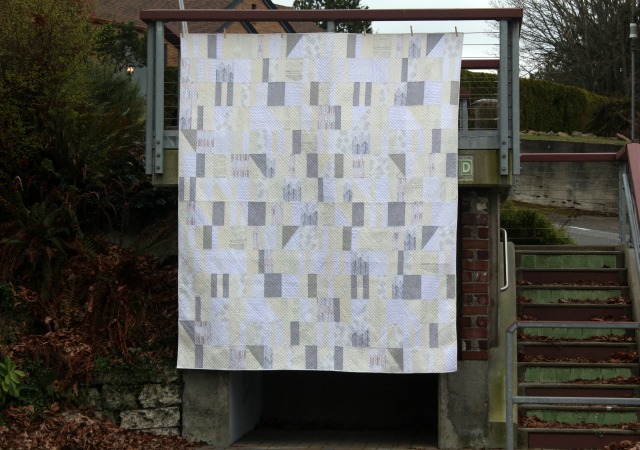 We conferred briefly about thread color (off-white) and quilting design and density, and before long, my quilt was on the frame. So for binding, all 416" of it, I used more of the Backgrounds Crossstitch in Gray by Lori Holt. And with that, I have a brand new bed quilt and am ecstatic to cross that one off my list. So pretty! I have always been drawn to low volume combos. Simply (as in its simplicity) gorgeous! Love low-volume fabrics. 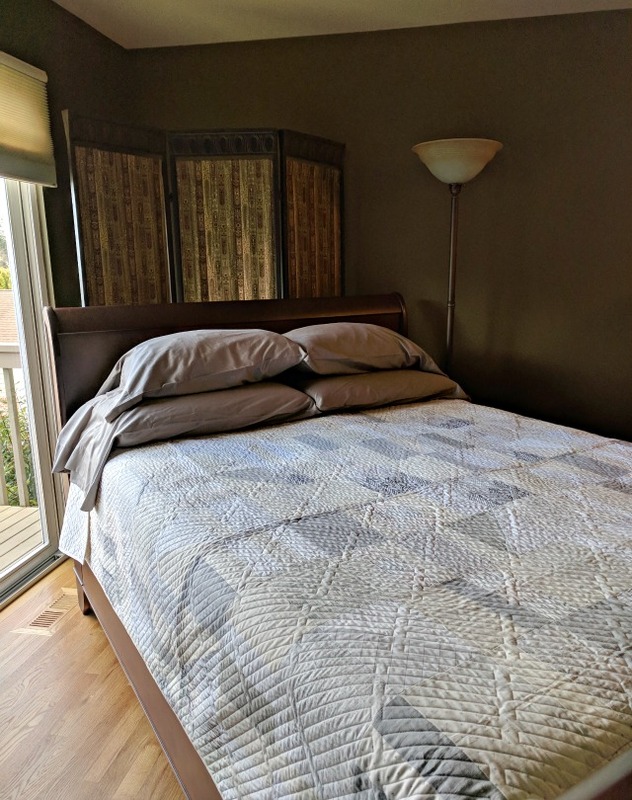 The drape looks perfect on your bed! Congratulations on the finish and I hope you enjoy many, many nights of rest and worry free sleep underneath it. It's really a lovely quilt. Is your bed queen sized? Oh my gosh, I love the color palette - it is so restful and one that I wouldn't tire of having on the bed for a very long while. It is gorgeous in its simplicity. Just a wonderful finish. Thank you for sharing it. What a lovely calm quilt to sleep under! 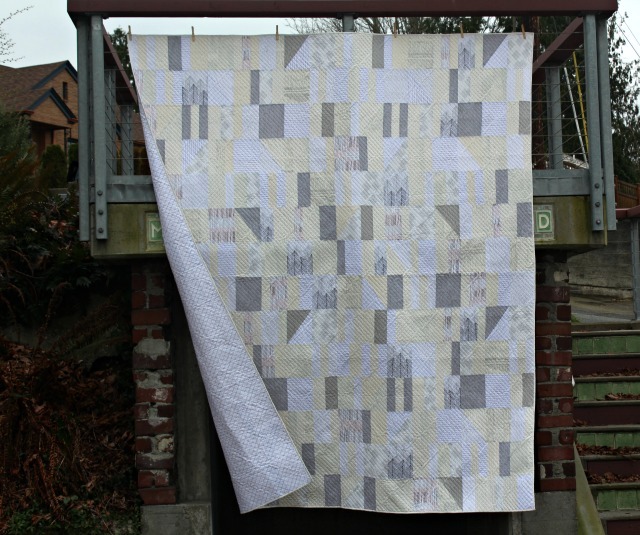 I love that you didn't go overly dense on the quilting - it drapes beautifully! It's awesome Debbie ! I just can't imagine making such a huge quilt ... Using low volumes for this pattern was a perfect choice. Love the picture on the stairs ! This is beautiful Debbie!! Love the quilt and quilting done on it - what a treasure! quilting, I agree, the drape is perfect. Smart move to ship your quilt off to Stitched in Color. Brandon did a great job on it! It looks SEW pretty on your bed. Beautiful quilt! It looks just gorgeous on your bed. awesome! love the elegance of the low volume prints ..
A beautiful execution of a very unique quilt pattern. 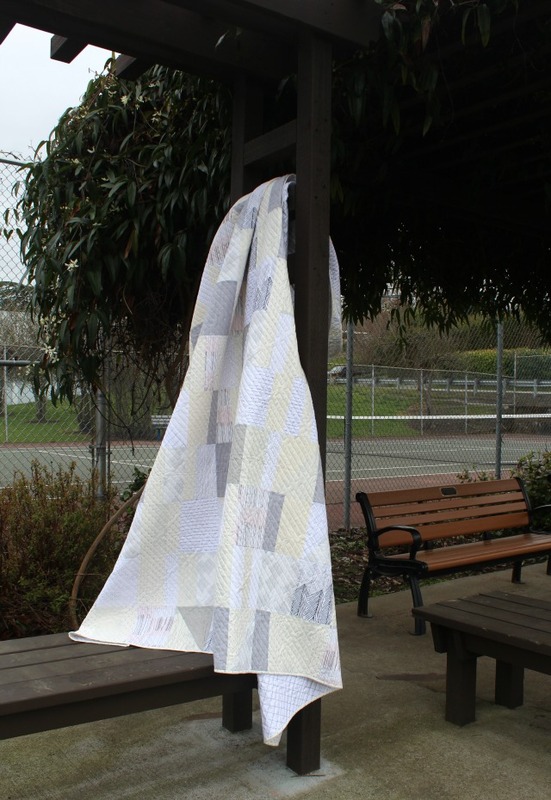 Thanks for the peek and the link to the Planning Quilt Size post. Most helpful! I love how quickly this went together for you! The quilt looks great. Beautiful Masterpiece of a quilt! 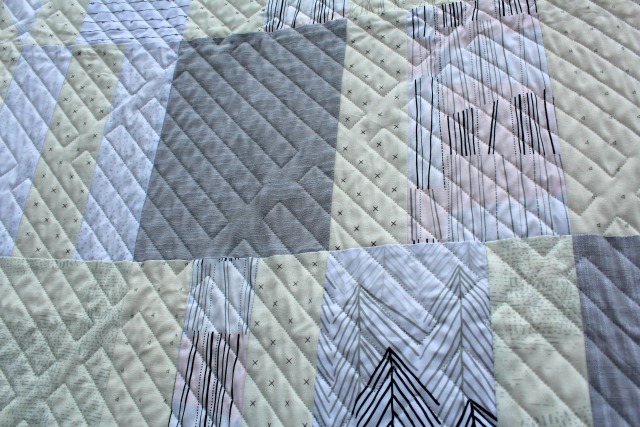 and the quilting is absolutely perfect for the quilt. Congratulations!